Regular maintenance is essential to keep your car running at its best. 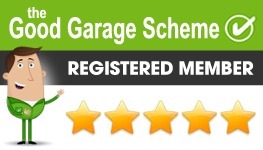 We provide quality servicing and as members of the Good Garage Scheme we adhere to the Industry Standard Schedule. Every full service comes complete with a personal copy of a 50 point check list for you to see what has been done during out service. Our servicing will protect your manufacturer’s warranty and keep it valid, ensure your service book is stamped and more importantly will be cheaper than main dealer service prices. We can carry out repairs on brakes, clutches, fuel injectors and electrics. We carry out diagnostics fault finding. It is an owner’s responsibility to ensure that their vehicle has a current MOT certificate as without this certificate, they will be unable to renew their road tax. Having a valid MOT certificate is alos a legal requirement in the UK. Out MOT nominated testers are qualified to carry out your MOT to the standard as governed by the Vehicle and Operator Services Agency (VOSA). An MOT can be booked up to 28 days of its due date. Out MOT centre is approved by the government Vehicle Operator Services Agency (VOSA). We have a comfortable waiting area if you need to wait while your MOT is carried out. We operate a reminder service so you don’t have to remember when your MOT expires, we will take care of that for you. We carry out bodywork repairs to ensure your vehicle stays looking at its best. We can look after your tyres. We can supply and fit from budget to brand. We can supply and fit quality exhaust systems. Many new cars come with air conditioning a standard now due to the passenger comfort it provides. However, air conditioning systems require regular maintenance. Here at Stan Reynolds Garage we offer a full air conditioning service from a simple re-gas to a full repair. Here at Stan Reynolds Garage we always use high quality parts to ensure that your repair does not need to be repeated. We will use appropriate parts to enable you to maintain a manufacturer’s warranty. We always want to ensure our customers have peace of mind about the repairs we carry out. In today’s market with cars becoming more high tech, regular oil changes are essential. Vehicles equipped with turbo chargers especially require oil changes using the correct grade of oil to avoid expensive engine and turbo charger repairs or replacements. We recommend annual oil changes using Forte engine flush and high quality engine oils because it is a fact that 95% of turbo charge failures are because of problems with starvation, oil contamination or foreign object damage. We can supply a collect and delivery service for your car. Just ask for this service when booking. If you prefer to drop your car to us we have a courtesy car service, which is available for all customers over 25 at a nominal charge of £5.00.